Check out this author if you like a good young adult adventure! I greatly enjoyed the time spent within the real and fantasy worlds. Review by Floresiensis Could you leave your world behind to save another? 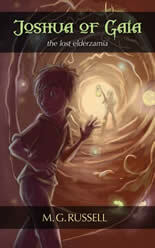 A fading world, an ancient evil and an impossible task for one boy. When Joshua is faced with the choice to fight or hide, what will he choose? Joshua of Gaia begins really, really well. The story hits the ground running, is engagingly written and complemented well by Danika Lindsell’s delightful cover illustration. The writing style is fluid, showcasing an admirable attention to detail and the realistic dialogue plus an amusing vein of humour running throughout comes together to create an involving and enjoyable narrative. I found myself greatly looking forward to the story that was to unfold. Let me get one thing of the way straight away. Joshua, the titular lead character, is an orphan. And what’s more he is shortly to discover that he is a little more special than either he or anybody else realised. This is of course a tried and trusted formula in fantasy but for me a good story rests on how it is told – and on how engaging it is – and not on whether or not it redefines a genre. When a lead character (Joshua) is so important to the story it is always essential that the author uses their words to allow the reader to build a clear mental image of what the character looks like and this is something that I though Russell achieved with aplomb, thanks to this passage in particular: “A scrawny, yet handsome boy of around twelve stood in the second floor hallway of a big, grey, boring house somewhere in Melbourne. His old hand-me-down T-shirt sat crookedly on his shoulders, with a crooked collar. He wore baggy jeans with white patches where the fabric had been accidentally bleached. His appearance was generally very shabby. Even his dirty sneakers were muddy and the laces left untied, falling to the floor. He was tall for his age and a little lanky. He had a shaggy dark brown hair and piercing brown eyes.” This provided me with an excellent mental image of exactly what Joshua looked like. And so we spend some time with Joshua at the orphanage, learning more about him and his current – and not terribly happy – life. But soon a portal is opened that leads him to a new world hidden from the knowledge of humans… And then the excitement really begins! I greatly enjoyed the time I spent within the book’s pages, both within the real and fantasy worlds. Numerous fantastical people, locations and objects are uncovered and older children and young teenagers will find themselves able to easily relate to the lead characters. I would recommend that readers from the age of nine upwards give this book a try, particularly if they have read and enjoyed the Harry Potter novels previously.